Rock Candy is a tasty sugar treat that’s been around for decades. It’s the perfect mix of hard candy and lollipop, with the added bonus of being a great tea or coffee stirrer! But how do they make rock candy? Like a gemstone from a mine, the crystals on every stick of rock candy are unique. However, they all come from the same source: sugar! If you look at a spoonful of sugar under a microscope, it looks suspiciously similar to the rock candy you’re (hopefully!) holding in your hand. That’s because it’s one and the same! The pattern and formations of rock candy’s unique look are actually enlarged sugar crystals. When making rock candy, producers make a supersaturated solution of sugar and water. It’s boiled down until all the sugar has dissolved and all that’s left is a clear, sticky syrup. Color and flavor is then added to this mixture, and it is moved to another container to prep it for crystal growing. A candy stick (or string, depending on the brand!) is placed in the sugar syrup. What next? Well, nothing! Once introduced to the syrup, the stick begins attracting sugar like a magnet. The crystals love forming on grippy, uneven surfaces, so wood texture is like…well, candy to a baby! After a few days, the super sweet sugar concoction has formed a film on the stick, and crystals begin to grow shortly after. Candymakers monitor the size of the crystals around the stick, and as soon as it gets big enough…Voila! Rock candy. It’s almost a miracle of nature! 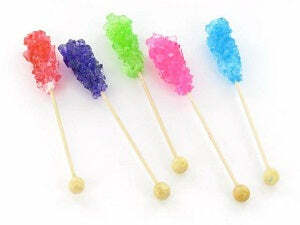 You can save yourself some trouble and grab a box of rock candy from our store! Take a good look at the crystals before you eat it, you’re holding a piece of science! Then take a big chomp, chew, and repeat.